Mix flour with semolina in a large bowl or on the kneading board. Make a small indent in it. Place small pieces of yeast into 100ml of warm water and mix with a spoon until dissolved. Pour the yeasty water into the indent in the flour, add pinch of sugar. Gently mix flour and yeast. Gradually add olive oil (2 ½ tbs) and 200ml of warm water to the flour, knead smooth, but not too soft, dough. Knead the dough for 5 minutes, then form a ball and place in a suitable container. With a knife cut a shallow cross on top of dough, cover with kitchen towel and let rise for 2 hours. Move the dough into the oven-baking pan (measuring about 45x36cm), flatten with hand into the shape and size of the baking pan. Cover and leave to rise for another hour. Prepare a mixture of olive oil, salt and water for brushing the dough. Heat oven to 230°C. Make small indents, characteristic for focaccia, with fingers in the dough. Brush focaccia with an olive oil mixture and bake in oven for 10 minutes. 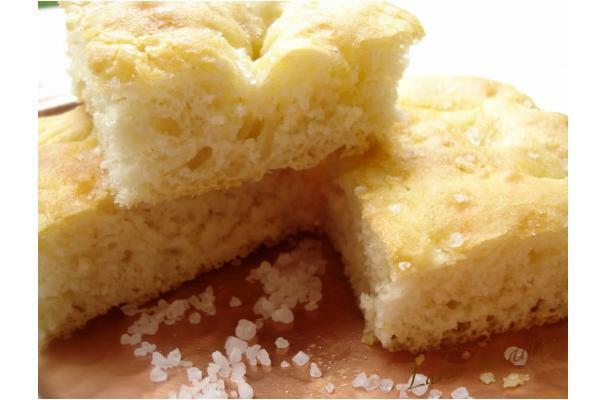 Sprinkle baked focaccia with olive oil and coarse sea salt. Simple, light pizza bianca (white pizza) with olive oil is the most popular Roman focaccia.